Found her home in Wilmington with Megan, Tina and Jon, their cat Ruby was unavailable for the family photo. They recently lost their boy Mackey who was a standard poodle and they just couldn't adopt another poodle, after researching other breeds they decided to adopt a greyhound. 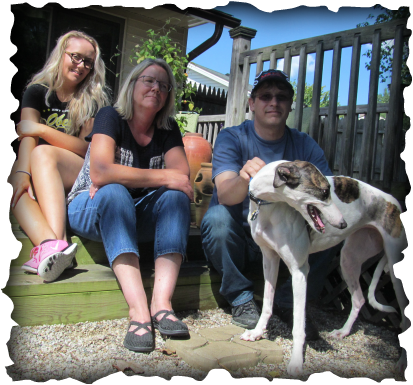 They met Sally and they knew they had made the right decision to give a greyhound a greyt home. Sally is a VERY lucky girl.